For many cities and towns across the U.S., particularly in the West, drinking water comes from mountain reservoirs and is delivered via gravity-fed pipeline systems. As a result of the drop in elevation, water agencies must carefully manage pressure in their pipelines to ensure that drinking water reaches homes and businesses at the proper pressure. In October 2011, the city of Portland, Ore., which has a vast gravity-fed water system, signed an agreement with Portland-based startup Lucid Energy Inc. to partner on the development of a megawatt’s worth of in-pipe hydropower within the city’s water pipeline. 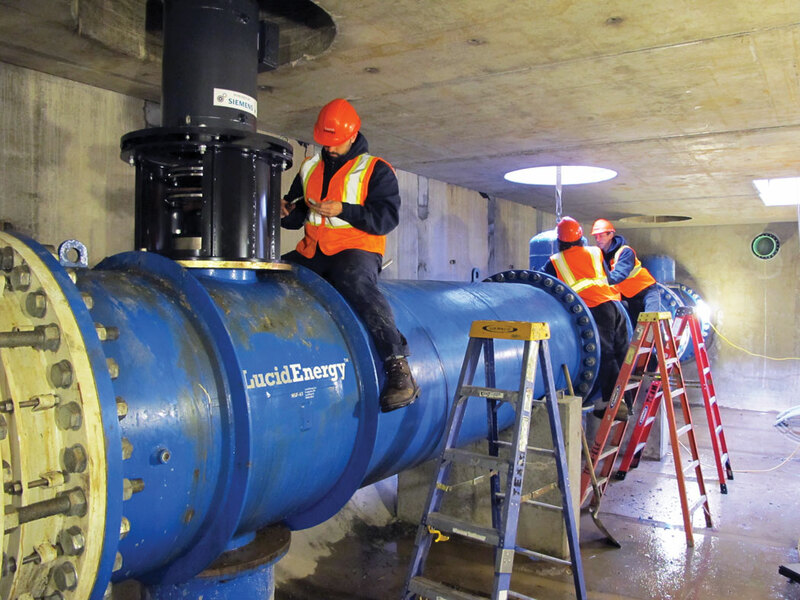 Lucid Energy began working with the Portland Water Bureau (PWB) to identify possible locations for its in-pipe hydropower technology, the LucidPipe Power System. Key to the agreement was that the systems were to be installed at no cost to the city or water bureau and would be funded entirely by private investment. In conjunction with the construction of a new reservoir on Powell Butte, PWB needed to install a new pressure-reducing valve (PRV). The PRV was to be installed in a horseshoe-shaped segment of pipeline beneath a street at the foot of the butte; the drop in elevation and excess head pressure at the location made it ideal for in-pipe hydropower production. Lucid Energy and PWB came to an agreement and drew up plans for the installation of a four-turbine LucidPipe system in a new pipe section just upstream of the PRV. The system was designed to convert approximately 20 psi of pressure (48 ft of head)—which would otherwise have been burned off by the PRV—into electricity. It also would reduce the workload of the PRV and help extend its life. Before construction could begin, Lucid Energy needed to secure a 20-year lease from PWB for the section of pipeline where the power system was to be installed. PWB and Lucid Energy also were required to make joint filings to the Oregon Water Resources Department in order to secure water rights for the project. Additional filing procedures were required to exempt the project from Federal Energy Regulatory Commission (FERC) requirements that normally are in place for traditional hydropower projects that potentially could affect the environment (fish, habitat, etc.). Because the system is installed within a water pipeline, there is no environmental impact beyond what normally is in place for water pipeline construction projects, so it was exempted from traditional FERC hydropower requirements. For PWB, the delivery of clean, safe drinking water was of paramount concern; therefore, it was essential that the product—and every step of the construction process to install it—met PWB standards. The LucidPipe system was tested and certified by NSF Intl. to NSF/ANSI Standard 61 for use in potable water systems. In order for the project to be financially viable, a power purchase agreement (PPA) needed to be negotiated with the local electrical utility. PWB and Lucid Energy signed a 20-year PPA with Portland General Electric (PGE) for the purchase of the renewable energy produced by the LucidPipe system, as part of PGE’s efforts to promote renewable power development and resource diversity. Once the PPA was secured, a grid interconnection agreement was filed with PGE, and rigid UL certification standards needed to be met. Lucid Energy worked with partner Siemens, which provides the generator and power electronics for the LucidPipe Power System, to identify the right products to meet the requirements of the Portland system, as well as the UL1741 safety standards for grid connection. The project, known as the Portland Conduit 3 Hydroelectric Project, broke ground in September 2013. The Lucid Energy team worked closely with PWB to ensure a seamless installation of the LucidPipe in conjunction with PWB’s ongoing construction. The system was installed in a vault beneath the street at SE 147th Avenue and Powell Boulevard on the east side of Portland. PWB subsequently completed its project, and the new reservoir that feeds this particular pipeline came online in July 2014. Final installation of the LucidPipe power components and grid connection could not begin until final financing was secured for the project. 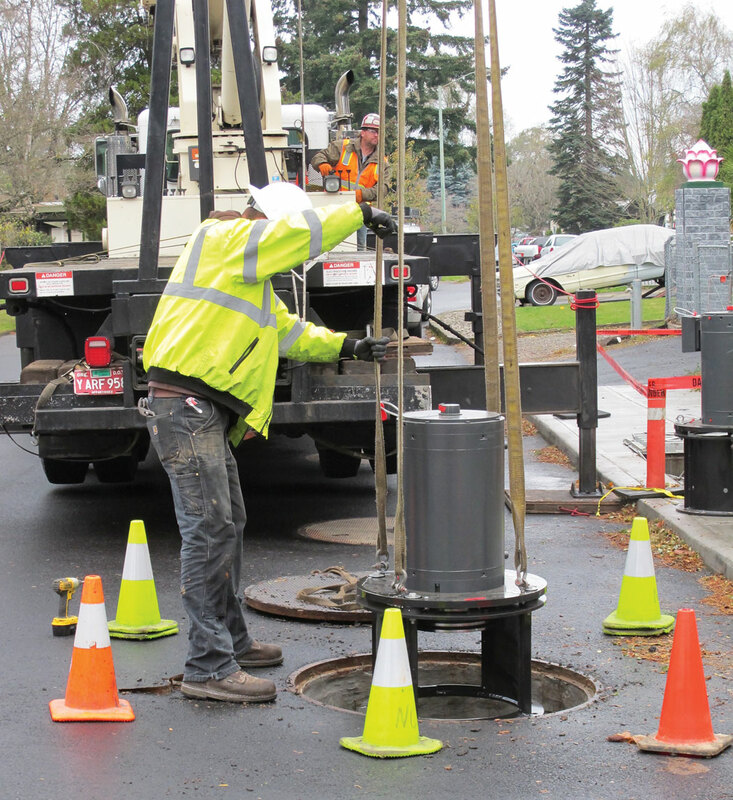 From the outset, it was guaranteed that the project would be completed at no cost to the city of Portland or PWB. Similar to the way large solar and wind projects are financed, Lucid Energy sought funding for the project entirely through private investment. Lucid Energy did the initial development and funding, and the final financing was secured in October 2014 with capital from Harbourton Alternative Energy, a subsidiary of Harbourton Enterprises. The full physical system installation was completed in December 2014, and in January 2015, Lucid Energy and PWB announced that the system began generating renewable energy for PGE and its customers through the PPA—earning it the distinction of being the first project in the U.S. to secure a 20-year PPA for renewable energy produced by in-pipe hydropower in a municipal water pipeline. The investor shares a portion of the power generation revenue with PWB to help reduce the cost of delivering clean, safe drinking water. PWB also is able to take advantage of the system’s smart water infrastructure to improve efficiency and water operations. After 20 years, PWB will have the right to purchase the system and own all of the energy it produces. Because pipeline has useful life in excess of 50 years, this is an opportunity for the investor and the city, and provides much-needed financing for smart water infrastructure with no out-of-pocket cost to the city. The testing and final commissioning process for the system is expected to be completed by March 2015, when the LucidPipe Power System will be operating at full energy generation. 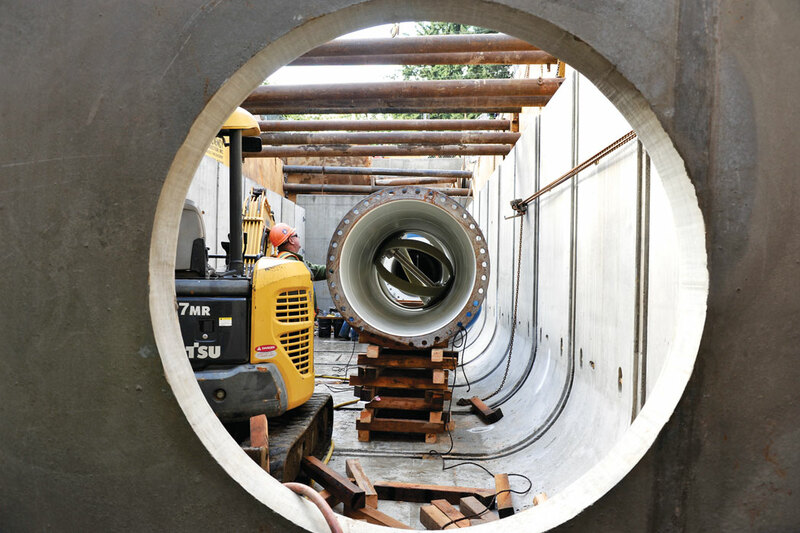 The Portland in-pipe hydroelectric system is expected to generate an average of 1,100 MWh of energy per year, enough electricity to power up to 150 homes. Financing is available for other cities with suitable gravity-fed water pipeline in which to install the in-pipe hydropower system with no out-of-pocket costs. 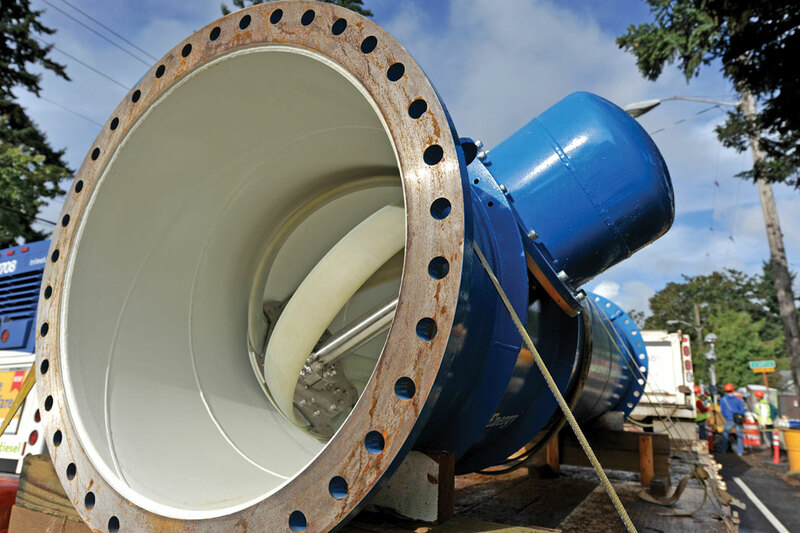 As municipalities face both rising energy costs—often the largest expense for water utilities—and the need to repair and replace aging infrastructure, in-pipe hydropower provides a way for water agencies to use their own infrastructure to generate renewable energy for their own use or, through PPAs, provide a revenue stream that can help offset costs and fund infrastructure repairs. Jennifer Allen Newton is president of Bluehouse Consulting Group. Newton can be reached at [email protected].